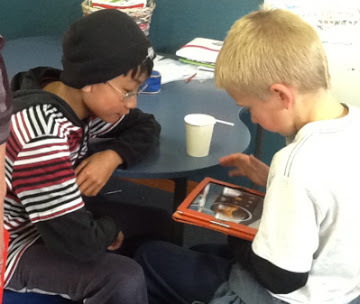 I arrived in the class during lunch break to find several of the children in the classroom using the class ipads. I’d love to tell you they were carrying out independent work on the mantle project, but in fact they were all playing on Garageband, making music for their own entertainment. And fair enough too. When the bell went, children arrived and everyone went to get their badges without prompting. They are now accustomed to this shift into their ‘ARS’ identity. Only 18 children in the class today. A lovely number. If only all class sizes were this small! The company ‘meeting’ began, chaired by one of the children (T). First thing was an email from Mr Somers (ARS boss) confirming what should be in the final presentation to the client. Andy was making use here of the fictional “other” to help guide and narrow the project – he wants to ensure the children can achieve the task in the available time. Mr Somer’s email also mentioned a rival firm ‘Global Simulations’ who are interested in the job and might be tendering for it too…. During the week, Andy had shown the class some designs from this other group – as exemplars for what their own outcomes might look like. 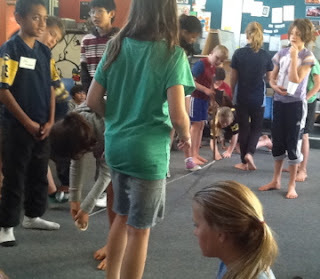 Next on the agenda was ‘visit from Wiremu’ and there was some discussion about whether this should happen straight away, or whether we should wait a bit – the children were anxious to get on with their designs – only 9 days to go until the deadline – AND there was now competition…. They decided they would do the visit first. … because he had found some papers on his boss’ desk that showed where the money for the project was coming from and he didn’t like it. 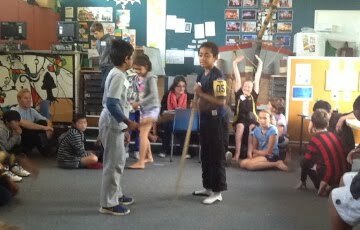 Here’s a video clip of me in role as Wiremu, revealing this information. After exploring their personal responses at some depth, I told the children I was now going to challenge them to explore an opinion that they might disagree with. 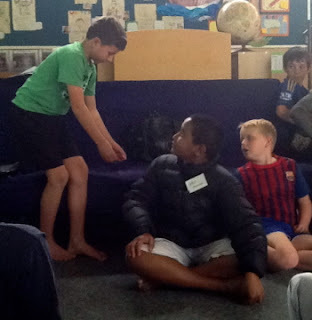 Numbering them off into two groups, I asked them to become Wiremu’s conscience – group 1 would take the position that Wiremu should definitely quit his job – group 2 would take the position that he should definitely stay. Each group huddled up and thought of their best arguments. Then, they formed a “conscience alley” and spoke these arguments as I walked through. 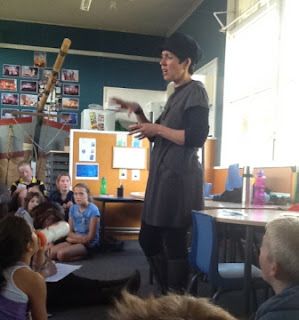 I didn’t fully go into role as Wiremu this time but rather carried the hat, as a symbol of Wiremu. Monday’s session concluded with Andy, the classroom teacher gathering the colleagues together for a discussion on what to do next. In many ways, this was the richest part of the whole Mantle so far. Children were highly reflective, engaged and spoke as serious-minded, responsible human beings with a real problem on their hands. It was great to see them referring back to the mission statement and mulling over issues of personal and collective responsibility – ethics and values in a really genuine way. This is ‘front end of the curriculum’ stuff – and I don’t know a better way to teach it! 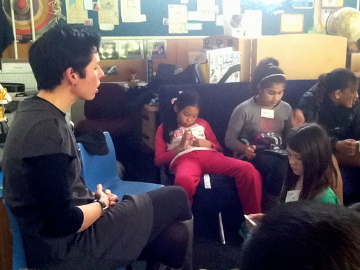 The session concluded with children deciding they would think about the issue and how to respond. 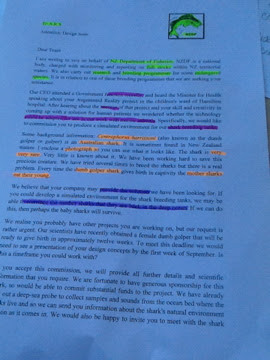 The general consensus seemed to be that it was important to get the work done (for our professional reputation) but that it would also be important to let our bosses and the clients know about our mixed feelings on the sponsorship issue. Both Andy and I felt quite moved and emotional after the session. 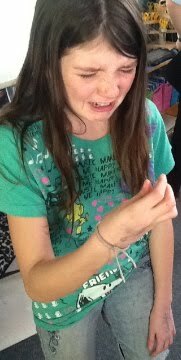 One of those moments when you are very gladdened to be a teacher because you sense something important just happened…. I’ll stop now and report on the Tuesday session in a separate post. Over the past week, the children have continued shifted from inquiry into the shark to more focussed work on their designs for the tank environment - with only two weeks to go we are on a tight deadline! 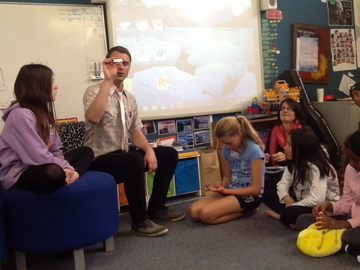 Andy made use of the black hat so that children could "Skype" Wiremu and check a couple of details. For example, they double checked the dimensions of the tank, which allowed them to calculate the volume of water required, and begin to think about water currents and flow. 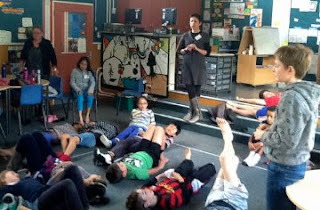 Andy also used drama to consolidate the imagined trip to Wellington, asking children to create freeze frame "photo album pictures" of key moments from the trip. Also during the week, the children received an email notifying them that a deep sea probe had been sent out to gather samples from the sea bed where the Dumb Golper Shark lives - and these would be delivered as soon as possible. This set us up for the Tuesday session. This session depended on a great deal of preparation from Gavin and the other student teachers and required a fair bit of negotiation with Andy. Everyone did a great job and for my part it felt great to hand over the leadership and observe Gavin working in role for most of the session. So, Tuesday began with the same meeting convention as in previous weeks. I put the Agenda on the whiteboard, and we held a general conversation to bring the "trainees" up to speed on what had been happening. One difference was that I took more of a back seat, asking D to call the company to attention and read out the agenda items. He became more interested in keeping the time - keeping a buzzer close to hand so he could let us know when we had used our time allocations. He also took notes on the whiteboard. 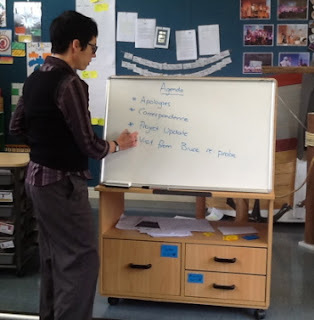 J was close at hand too - once the meeting was underway, he jumped up to provide security and "guard" the whiteboard. After apologies, correspondence and a quiet update in small groups, we moved to the visit from Bruce, the probe guy. We spent a bit of time thinking about how we would welcome this visitor to the company - I asked where the meeting should take place and what sort of protocols should be followed. Children had lots of ideas including making coffee (this was mimed), welcoming him formally by name, shaking hands, clearing the nicest chair, gathering around and taking notes. I noticed P took leadership here, gently asking people to clear the space and checking everyone was ready before Bruce arrived. Bruce arrived (Student teacher Gavin in role) - entering through the classroom door. No need to verbally signal this time as children are becoming used to the Teacher in role strategy and were expecting this. Bruce was welcomed, shown to his chair and, after some social banter and a bit of an introduction, he started telling us about the probe. Bruce informed the company that the probe had successfully visited the ocean floor and brought back samples of sludge, water and sound (students asked whether future probes could also be arranged for samples of fish and visual images as well). However, he revealed that there was a problem with the sound file as there was a lot of "interference" - sound from the probe itself and from non-natural sounds in the environment. He asked the company whether they could help listen to the sound file and isolate out the different sounds. A few minor technical issues (ably sorted by J and J - the self-identified 'technical guys' from the company) and we were able to listen to the file. This was a task in active listening. In planning the session we had identified a learning intention from the Music-Sound Arts curriculum to do with being able to describe the qualities of sound. 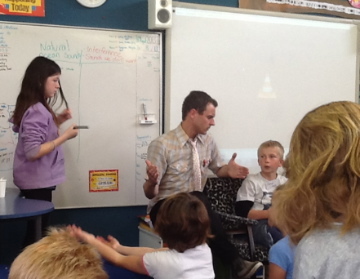 So, Gavin took time to encourage students to find words to describe the sounds they were hearing. 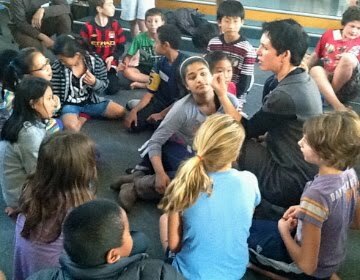 There was a lot of peer and whole group discussion about which were the natural sounds and which unnatural. Children took notes on the board. Then we asked the company for ideas about how we might help Bruce with this problem. Fortunately (by a cunning stroke of fortune - aka teacher planning) the colleagues had received 'professional development' the day before on how to use Garage Band software on the class ipads. One of the children was quick to suggest that this might be the way forward... We could attempt to reproduce the soundtrack without the interference. There was some debate over whether it was better to work with the existing sound track and try to eliminate the sounds, or whether we should start again and try to mimic the natural sounds from other sources. This was the direction Gavin "led" the children towards, as this was the activity we knew they had the resources to complete successfully. An important point was raised here by one of the children (K?) who quietly spoke up and pointed out the fact that perhaps, if these artificial noises had been occurring for a long time in the area where the shark had been captured, then they were in fact FAMILIAR to the shark and so should be INCLUDED in the sound track. A lovely example of what Boud (in Problematising practice-based teaching, 2012) calls "Emergence" in teaching - 'the fact that not all worthwhile things can be planned for or specified in advance'. A little further discussion and it was suggested that perhaps what we needed was the natural soundtrack with the unnatural sounds on separate tracks so that they could be introduced if necessary. One of the children (A) suggested that when we finish the sound track we should run an experimental session with the shark - playing the natural sound track first and then adding the other sounds. Then 'if we see some kind of negative reaction - we can change it back'. Good thinking! 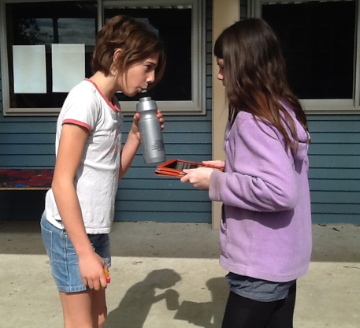 The rest of the session was self-directed exploratory sound making using Garage Band software. Children tended to start out with instruments, but quickly moved into recording when they realised they could generate interesting natural sounds from the environment. 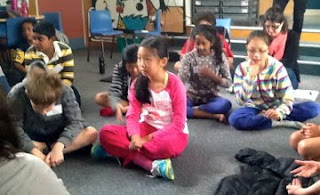 Below you will see some photos of the children engaged in experimentation, recording, discussing and sharing the sounds. The session concluded with a brief round table discussion of work in progress. I asked the children to close the ipads and put them down, so that I could challenge them to TALK about the sounds they had found (trying to promote that use of music - related terminology related to duration, pitch, timbre etc). This is something Andy will continue to deepen over the next few days. 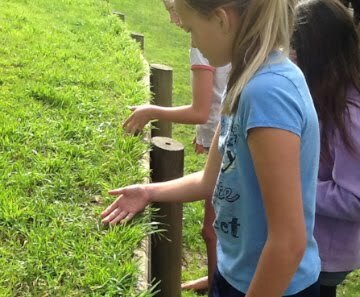 Does stroking the grass make a sound anything like water? What about if I slosh the water in my water bottle - does that sound useful? Are there any 'built in' sounds on Garageband that sound right? Here, two children (E and T0 talk about their attempt to replicate the sound qualities of the ocean in their 'found sound' recordings.... Will they convince the shark??? Session three was a mixed bag - with LOTS to reflect on. This is one of the strengths of Mantle of the Expert - the way the learning is applied to the context we are in "now" - rather than stored away for some future time when we might need it. We cleared tables and chairs away because I felt we would probably be working physically for the whole session and one objective was for the children to end up taping out the dimensions of the Shark tank. The children came in from morning break, went straight off to fetch their name tags without my bidding, and all sat on the carpet ready to go. At this stage I had a very clear sense that the class members have moved into a state of deeper engagement. As teacher it felt very "easy" to begin the session. I didn't need to 'hook' the children's attention or ask them to come with me... they were already "there". Before moving into role I took some time to thank the class for the way they have been working so far. I acknowledged the fact that they have had lots to cope with - people coming and going in the classroom, lots of new ways of working. I complimented them on how they were being responsible and mature both in the fictional world and in the real world of the classroom. And I made a point of saying something else: "One of the things that makes this kind of drama work well is when people who are taking part can find the difference between what feels funny or cool and what feels right or true for the world we are making together. More and more I've noticed you choosing things that feel right and that's really helping." One of the students complimented J (absent today), drawing attention to how well he'd been doing at this. I decided to have this out of role conversation with the children partly to encourage those who are still tending to make 'offers' that are comic or over dramatic, to reflect on 'aptness'... 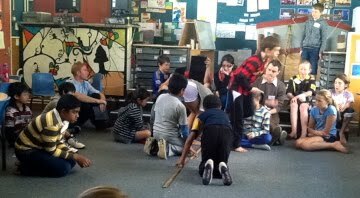 I remember reading about ho DH used to do this - reminding children who (in improv terms) went for the 'gag' or the 'block' or the 'steal' not to move or do or act till the thing felt "right"... It's been a challenge for some in this class who are enjoying the power to make anything happen SO much they can't resist catastrophising or exploring their love of guns, war and ammo! So, I guess this challenge to work sensitively and thoughtfully was a "learning intention" for the session. I even said "We'll go into the drama now, and at the end we'll check in on how we got on".... Ooo, assessment! Into the dramatic world... Or rather into a shadow world midway into role in order to plan what the fictional role would do. The children knew that today was the day of the imagined trip to the aquarium in Wellington. So I asked the children to think about what kind of transport felt "right" for our company to use for this trip. This caused quite a debate and opportunities for think - pair - share and whole group discussion on the relative environmental merits of plane travel vs bus travel and the balance of efficiency of time with efficiency of spending money. E helpfully put the mission statement on display so that we could reflect on the kind of values we stand for as we made the decision. Several commented that it would be great if there was a fast train. B reckoned we should put in a bid for a fleet of electric cars (for next time) though he could also see that lots of vehicles = lots of engines, so maybe that wasn't as sustainable as travel by company bus. Finally we had a vote (P counting the hands) and settled on travel by plane. One or two of the boys decided they wanted to go first class, but would use "their own money" to upgrade, rather than company funds. On reflection, I can see that I cut this debate short ... it was really engaging the children and we probably could have continued and deepened. The ethical questions were important and children had more to explore. I admit it - I was guided by wanting to get on with the trip - and the drama! And so we moved into an active mode. 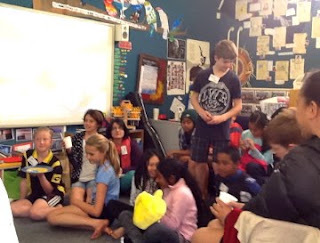 First children were asked to think seriously about what they would pack to take to Wellington. They were asked to create the space for an imagined briefcase in front of them (done without hesitation - they are all so able to use their drama eyes by this stage)... Then I invited them to think about what they would take - and how they would handle the objects as they loaded them into the briefcase. Because how we handle the items we work with tells us as much about the company we are as the words on our mission statement. Children worked with lots of care and attention to detail at this point. Briefcases were packed and then a few individuals were 'spotlighted' - invited to stand, show their mime of one item they packed - along with a few words to say what they were thinking when they packed it. Children's spoken thoughts included: "I'm taking my ipad because I might need to take notes", "I'm taking this modelling clay (it was obviously heavy), so I can sculpt possible designs", "I'm packing my scarf because we all know how windy it can be in Wellington". I was impressed with P who came over quietly and asked me whether, if our company was a high stakes operation with a big budget, he MIGHT be allowed to carry a hand gun? I replied "decide what feels right or true for the kind of company we are" - and later we saw him carefully packing his computer keyboard instead. So, we were ready to set off. Now, how to experience the journey to Wellington? Doing 'journeys' in drama is always interesting. I try to avoid a "lived through" mode - I confess I don't really like lining up chairs and pretending to be on the plane.... this can feel a bit like the drama equivalent of the "wheels on the bus" song - a bit shallow in terms of exploring what it means to make a journey... This can be great for little ones but something more is needed with older ones. Instead I find it useful to focus on key moments from the journey - moments of tension.. I asked the children to consider some of the small 'hitches' that might arise between leaving the office and arriving at the aquarium. Again, we had to check the temptation to go for the over-dramatic. A's first suggestion was a plane crash, but when we talked about that he could see it would result in a different kind of outcome - one where the commission was no longer the prime focus. So he changed his mind and said "maybe we leave the blueprints behind, and have to rush back for them..." Everyone thought of a 'hitch' and how it was overcome, and portrayed this moment as a freeze frame. These moments in time were shared between small groups. I'm not sure what this child ( I ) is depicting here (pictured left) but it was clearly upsetting! Perhaps one of the student teachers can fill in the details? While the groups were sharing, I worked 1:1 with R - one of the taiwanese boys. His confidence is growing really well in drama and he was able to imagine some really nice tensions. His first suggestion - "lightning hits the plane" felt like rather a big problem but when asked to think of a "small problem" he quickly suggested "tea spills on me" and mimed staring down at an imagined tea stain in his lap... We decided this problem would be solved by grabbing some spare trousers from the briefcase and quickly, all was well again. So far, so good. I told children that we had now arrived at the aquarium and I would be taking on a role. I remember hearing a child say "choice..." I clearly signalled the role using a black cap (the cap would be used again later in the session, so I wanted to make it clear that it was a sign). 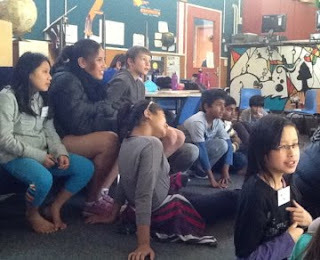 I told the children that when I wore the cap, I would be in role as Wiremu Hastings. Who did they think he might be? 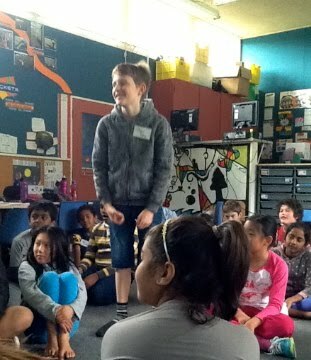 S guessed that he sounded a bit French, but P correctly guessed that he was Maori, given his first name. I decided on a Maori character because I want to make space for indigenous understandings about sharks within our inquiry - and so far, children haven't gone there in their research. It was a strong moment, and I don't think I made enough of it. I had planned only for Wiremu to meet and greet the company. I could perhaps have encouraged more conversation by inviting them to tell me about their trip... But in the event I came out of role quite quickly because I felt we needed to create a shared sense of what this tank looked like. The task got rather loose as some children moved uncertainly through the space and others looked on. I noticed some of the boys had picked up their ipads - when I checked with them, they said they were searching for the aquarium on google maps. They had heard me use the words "map out the tank" and interpreted this as being about finding it on a map. Oh the importance of our words! 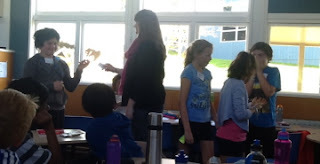 I decided it was important to find everyone a job - so I asked children to choose whether to be part of the measuring team or to come to the other end of the room to talk to Wiremu. On reflection, it might have been better to involve everyone in the measuring activity. I could have set up small group tasks - in groups, children might have been invited to make a scale drawing of the tank with paper and pencil or even with popsicle sticks (each stick representing 1 m). 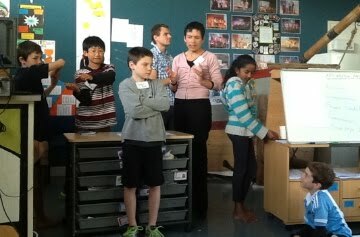 At the time, I was only thinking of how to make one collective sign of "the tank"... and I was keen to see what happened if children were left to solve the problem without guidance - which they did very well (the student teachers stepped in a bit too) .... I guess Andy can pick up on those other maths possibilities later. Meanwhile, down the other end of the room, we were setting up for an interview with Wiremu. I could see a possibility for using the 'expert quiz' convention (one I learned from Trevor Sharp - kia ora Trevor) in which children speak in role as someone with a lot of factual knowledge. The idea behind the convention is to provide a CONTEXT for factual information, historical facts, statistics etc and to see whether students can demonstrate understanding of the information they have gathered, by recognising when their piece of information correctly answers a question. For this, I had prepared a whole lot of slips of paper with facts about the Dumb Golper on them. Most of the facts came from the children's "fact board" and showed the results of their inquiry. 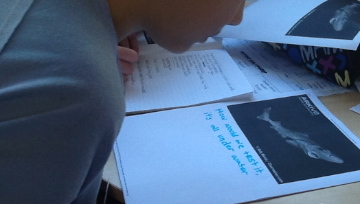 Some additional shark facts were also included - I'd researched myself and looked for new information, including information on Maori attitudes to sharks. These shark facts were handed out and we took time to ensure that everyone understood and could explain their fact to a peer. The ESOL students were supported by their teaching assistant to translate the facts they'd been given. 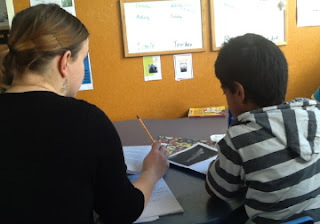 Other children checked in with student teachers to check the meanings of any vocabulary that was unfamiliar. I was thoughtful about which facts I handed to which child, depending on their reading ability. Meantime, of course, the taping process was still going on - and we had to make allowances for our colleagues who needed to move through our space with the rulers and sticky tape. Everyone coped well, considering! Taping concluded, the measurers joined the team ready for the interview with Wiremu. I explained that this time I would not be taking the role, but we would imagine I was sitting next to Wiremu (signified by the black hat on a chair) in the staff canteen, asking him a series of questions. 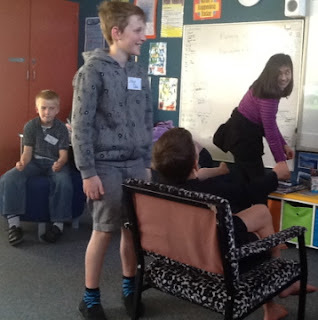 They - the children - would be speaking for Wiremu - responding to the questions based on the shark fact they had in front of them. I reminded them that people don't generally just speak facts, but put the information in a conversational way. I also told them that I would be asking SOME questions that were not facts, but personal conversation... 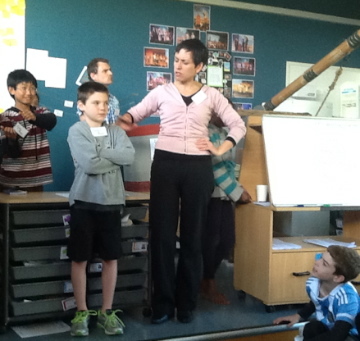 I demonstrated by asking Wiremu how long he had been working with the Dumb Golper shark. One of the children responded straight away with "five years"... They had the idea. The 'expert quiz' proceeded with children listening out for a question that 'matched' their piece of information. Only one or two children did not volunteer a response. 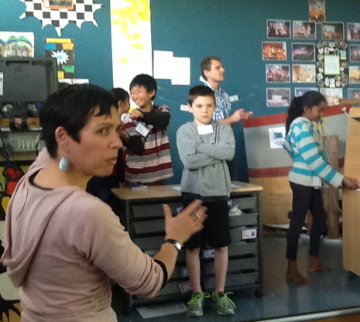 Several spoke over each other - requiring them to practise skills of listening for a space (no 'hands up' here....!) 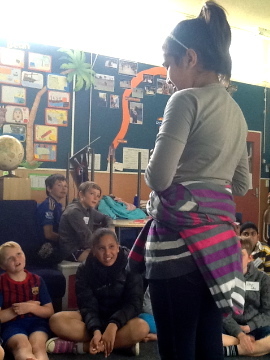 After the conversation with Wiremu, we talked about the new or surprising information we had found out. A strong theme emerging from the conversation was the idea that human beings are the biggest threat to the Dumb Golper sharks. B told us about their livers - which are enlarged and heavy - helping them to stay on the sea bed (the word for this - Demersal - was written on the board). We heard that human beings sometimes enjoy shark liver for its supposed health benefits. 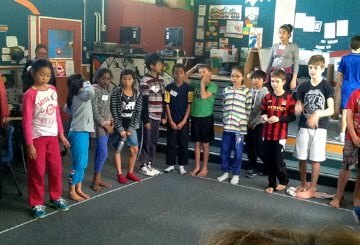 We also heard new information about Maori attitudes to sharks - they are traditionally seen as guardians, rather than feared and we heard that in Maori mythology, the Milky Way was created by sending a shark to swim through the sky. And then we stood up around the edges of the taped out area - imagining it as the shark tank. I remember thinking "we only have 10 minutes to go" and "I'm not sure this next idea is going to work"... I should probably have gone with that instinct because it did get a bit ragged! Children were invited to imagine themselves as the female golper swimming in the tank. I tried to be clear that we were not looking at how the shark moved, so much as how she feels.... but naturally enough, given the opportunity to "play" an animal, children made imaginary fins and even added jaws type "da-du-da-du" sounds as they moved into the tank. I responded by asking everyone to lie on their backs - to take themselves back in time to before they were in captivity, when they were still out in the sea. I asked them to imagine what they could see and hear around them. Some of the children hadn't opted to join in ... Interesting - was it a lack of space on the floor? A feeling that the task didn't feel "right"? Were they tired? Did they just want to watch? I didn't push them to participate but instead asked them to think of questions they might ask the free sharks.... N had a question "What is it like to be out there in the big sea?" - and she approached one shark to ask them. Good instinct N! I should have gone with that more structured ritualised way of encouraging responses. Instead, I invited any shark who wanted to answer, to speak into the silence. We got a muddled chorus of responses - and some jokey ones... "I'm dead" - "I'm hungry" - "I feel free"
At this point, if I'd followed my earlier stipulation of only going with what feels 'real' and 'true' - I'd probably have cleared the floor and wrapped up with a reflection. But I pushed on because I felt I should listen to the captive sharks' point of view as well.... and, honestly, I hoped that if I stuck at it the children would find a deeper response to the role. Probably Not the right call - I've learned before that pushing on with the drama is rarely the right call....! I asked them to flip onto their stomachs and respond as shark in captivity. They did OK, but it was getting noisy, and silly. My favourite comments in this section were when one of the questioners (D?) asked the sharks "what do you think of those walking around creatures who captured you?" and one of the girls (T) answered "they have very small eyes". After a few attempts to focus the children, I pulled out! Asked them to stand and shake off the role and we gathered on the mat. We talked about how tricky that last activity was - how it was one of those times when it was hard to take the drama seriously. And we checked in on how we felt we had managed today at making choices that felt "right" for the drama. I asked children to raise a hand and give themselves a 'score' out of 5. I noticed A giving himself two and a half, based on how he'd 'lost it' a bit during the last activity. Overall though a very rich session with much to reflect on. Initially I felt quite unhappy with it but later I realised there had been golden moments, and I can see that the session certainly moved us on so that the commission feels tangible. 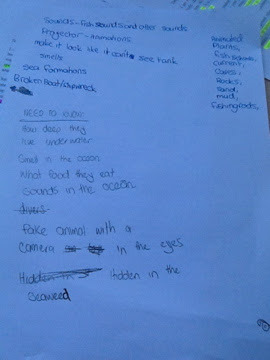 Roll on next week, when we will explore the creation of a soundscape for the shark tank. Student teachers are planning madly.... Can't wait to see what they come up with. Andy and the children made quite a bit of progress in the week leading up to our second visit. Not able to work on the mantle full time (Andy says this is a stage of the year where he has lots of "loose ends") they had nonetheless managed to develop some important aspects to help build belief. 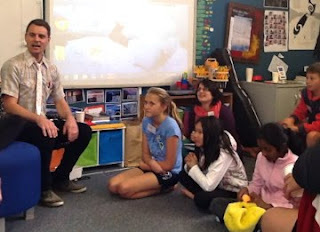 One of the first things Andy did was ask the students to write letters in role as the company. The letters followed on from the drama work done in the first session, and were written to the hospital in an attempt to persuade the staff to accept the simulation room. Opportunities here for the persuasive argument writing that Andy had identified as one of his literacy goals for the term. Following on from the letters, the class quickly settled on a name for the company - Augmented Reality Simulations or A.R.S. for short. Apparently there was some discussion about those initials and whether they might look 'rude' but the consensus was that it would be ok, as long as the all-important dots were used! The children also spent time mapping different parts of the company offices on paper - this was done in small groups, with each group taking responsibility for one area. A timeline was produced, showing the history of the company, with each member adding a sticky note to show when they joined... All these aspects are very important for establishing the sense of history and prestige that underlies the expert framing. Also important to mention is the preliminary work done on the company's mission statement / vision. Over the course of the week, the company received letters from grateful clients (provided by the student teachers - thanks guys!). These included a memo from the hospital acknowledging the positive results from the simulation and a thank you from the airport for the work carried out there. The letters were revealed in a company "meeting" and Andy invited students to comb the wording for evidence of what the letters reveal about the reputation of this company. As key words were identified, one of the children recorded these on an ipad for display on the smart board.... A long list of attributes was produced, including 'efficient', 'hard working', 'good communication'. Some students also wanted to add other things not implied by the letters. In particular, there was a concern for 'sustainable practices' to be included in the company identity. And so to our second Tuesday and the visit of the student teachers and myself to the class. Andy had a quiet word before the class and warned me that a couple of the students may be slightly disengaged - he felt that they hadn't been fully captivated by the mantle experience to date. In addition, it had been a challenging morning for one child in particular, who had been absent for most of the week and was only in school for this one day. With this in mind, I wanted to ensure that we included some physical activity and didn't spend too much time sitting about in whole class discussion. The original intention for this session was to work on the mission statement and then lead into the commission letter. In the event, however, I made the call to start the session more actively. After a brief chat out of role in which we agreed to frame the student teachers as 'trainees' we made the shift into company mode (signalled by the fetching of name tags and my 'calling the meeting to order'). The meeting began with apologies, a report on correspondence sent and received, and a project update (groups of children talking with student teachers /trainees about what they'd done during the week). I felt that students still needed to build belief in the company and decided to do this through drama. 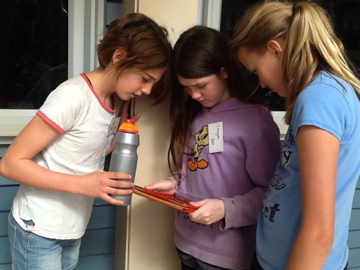 The maps produced by the children provided a useful way in to this activity. Conveniently, it turned out there were five maps and the same number of student teachers! Holding each map up in turn, I asked its authors to stand and then allocated them a trainee to take on a tour of that part of the building. They were asked to think which part of the room might represent the area on the map. I deliberately matched our male student teacher with the boys who had mapped the security area. After four or five minutes of open ended exploration, I asked each group to freeze and show a moment in time of the work going on in their area of the office. We spotlighted each group in turn and "tapped in" to the thoughts and actions of each person. Still fairly low key drama here - some of the more self conscious students are still getting used to expressing themselves in role. But gradually we built up to groups speaking in their own time, creating some quite successful little scenes. A scene from 'the lounging room'. We are the kind of company that allows space in the day for watching TV and making coffee. D (boy in the background) is reading the paper. In this case, I opted to produce a letter with a very formal tone. It was long and complex - particularly tricky words at the start but with key information in more accessible form below. Copies had been made for everyone in the room. 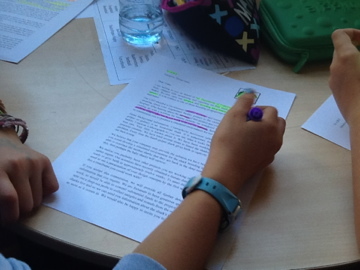 Students were asked to arm themselves with a pen and highlight any words they didn't understand. Volunteers read the letter paragraph by paragraph and slowly we figured out what it meant. adopted the stance of "one who does not know" - repeatedly asking for the students' help to understand the letter and saying things like why do they have to use all these long words? Can anyone help me? I don't understand how they think WE can help? I wanted to slow things right down and ensure that everyone understood the basis of the commission. Here's the opening of the letter - and a view of one copy after it had been examined by one of the children (Highlights indicates important information about who wrote the letter, parts of the text where we learn what they want and words and concepts that are unfamiliar and need looking up). I was impressed by the level of focus at this stage of the lesson. Looking around, I could see almost all children poring over the letter and grappling with the language. Even the boys identified as being less engaged were having a go and circling some key words. It was also interesting to observe how the process of decoding the letter evolved fairly spontaneously into inquiry. Several of the boys jumped up and grabbed the class ipads to look up the details of the shark. Others began brainstorming ideas for the simulated environment that our company might build for it. Whole class became small group work as I tried to encourage children to formulate inquiry questions and think about next steps. There was plenty of evidence of engagement - lots of children rushing about eager to tell me, the student teachers and each others things they were finding out. Those with important information were asked to add it to the handwritten "fact sheet" on the whiteboard. The self-directed inquiry took us right up to the end of our session. Some children were began to formulate questions based on things we will need to know, or problems we might face. Some of these are shown below. Next steps for Andy and the class will be to finalise the mission statement - this is quite important so we have a visible, written expression of who we are and what we are about - ready for later in the mantle when this will be challenged. The children will also continue the self-directed inquiry. The beauty of a Mantle approach to inquiry is that the exploration is given purpose and focus... children are not just "doing sharks" in a general way - they are asking specific questions related to a fictional but VERY AUTHENTIC context in which the knowledge they are learning needs to be APPLIED. 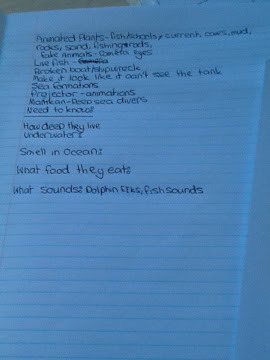 For example, D was enormously excited about information he found on the distances these sharks can see. He was able to infer that we would need to factor this in to our decisions about the environment we might build for the tank. At the end of the lesson he was mulling over the question of whether we needed to actually MAKE the tank big, or just CONVINCE the shark somehow that it was big.... Higher order stuff. By the end of the session I felt the engagement levels were high. Several children were talking about carrying out research later on when they got home. One student - searching for information on the Dumb Gulper found this blog.... that's an interesting and unexpected occurrence! I guess I just need to write with an awareness that the children might be part of the audience. If so - hello - feel free to comment guys! So, all in all a very promising start!